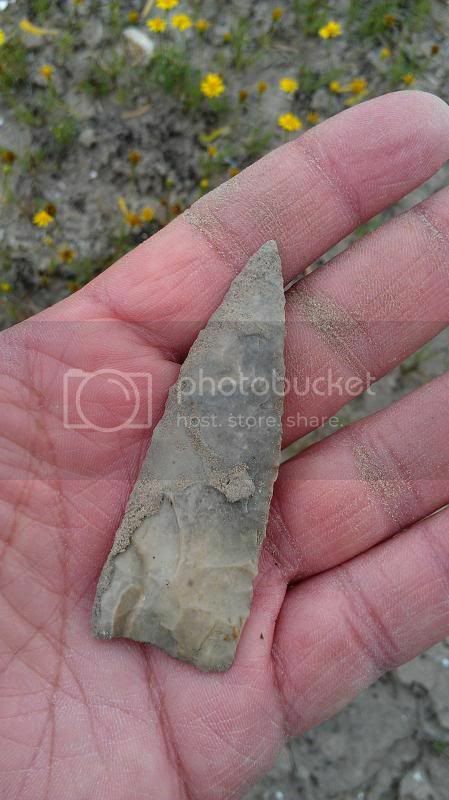 Had a great weekend with some unusual finds for the Rio Grande Valley. Some good looking finds there. That last one is definitely Paleo. 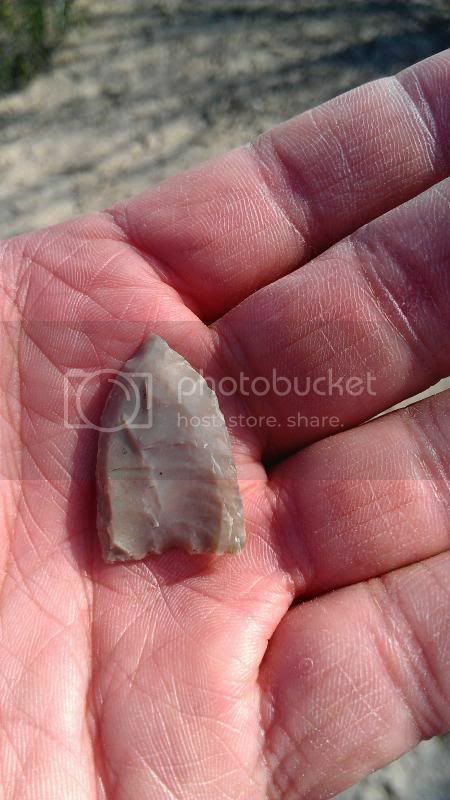 I hunted some up around Rio Grande City, Roma, and up towards Zapata many years ago. 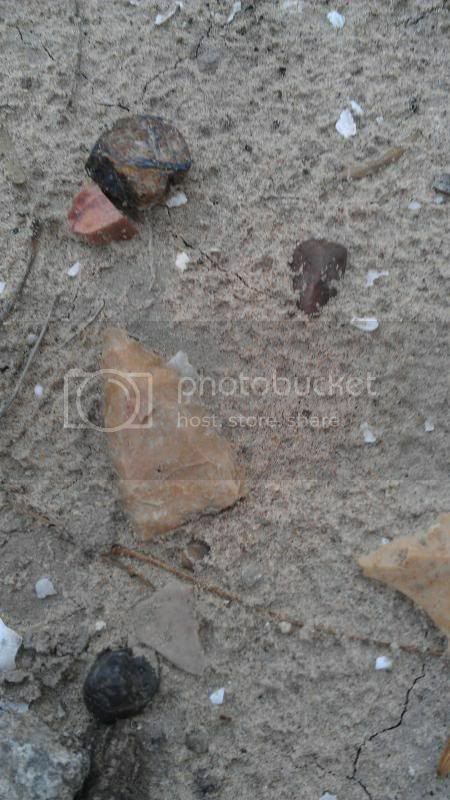 Good area for agate and petrified wood too. Thanks! I've been meaning to get out to Zapata and Webb Counties. I really want to add a caracara to my collection! I've found Matamoros, Cameron, and Toyah between RGC and Roma back on a friend's ranch many years ago. Good hunting and some good quality material to work with. That "definitely Paleo" looks like the heavy channel we all know & love on the Folsum points...the Langtry's just a nice bonus. Small matter of interest.. The "Starr adventure ranch " near Florence TX was named after Starr county where the family had land and sold it to move to Williamson county. 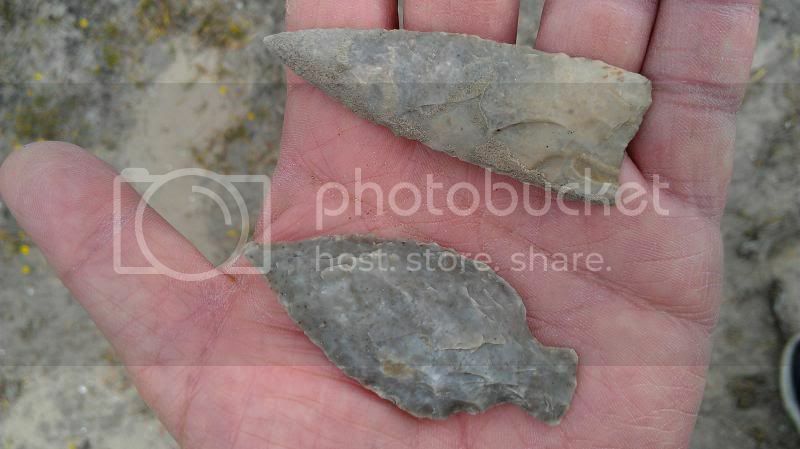 great finds----a number of years ago i looked on a few sites between San Ygnacio and Zapata on the rio grande found various triangle types, toyahs and a killer one inch white folsom. almost every visit to the sites the border patrol show up they ask what i was doing. 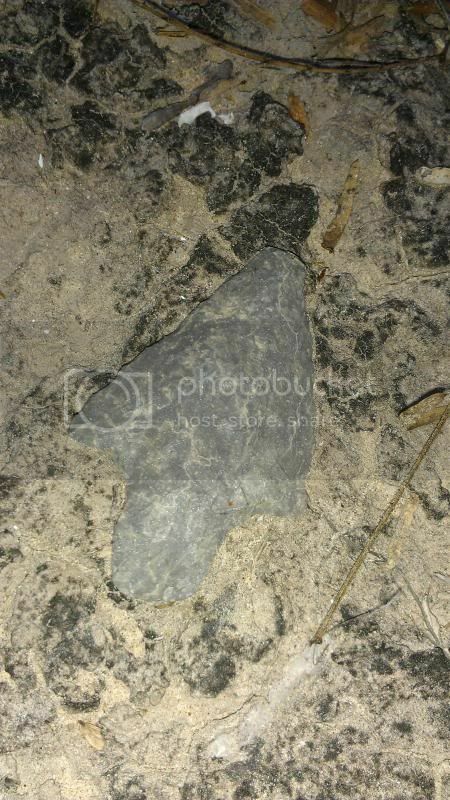 i told them i was looking for arrowheads and they said they were just checking and went on there way. one time one of the border patrol agents even told me a of a nearby site i did not know of. nice guys! Interesting bit of history. Thanks for sharing that, SH. Thanks, angus! Zapata County is amazing. I lived there when I was a kid and remember seeing an awesome collection that a friend of my dad's had been building since he was a young boy. 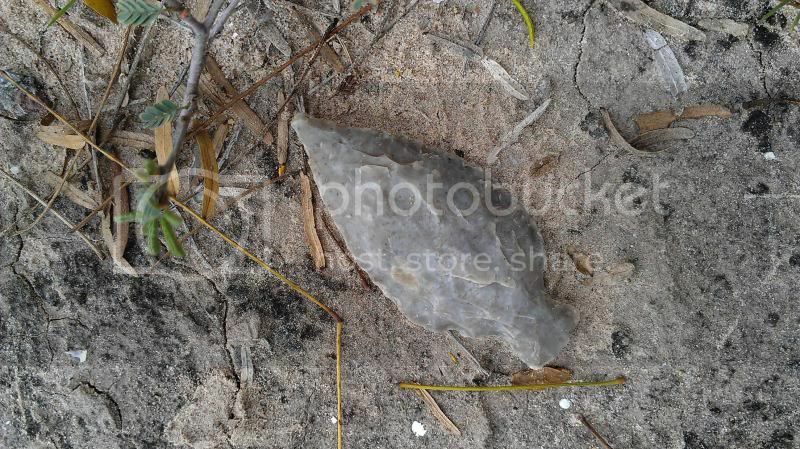 Found this on Saturday when I found that Langtry. Half a two-sided metate and the rest from that day. 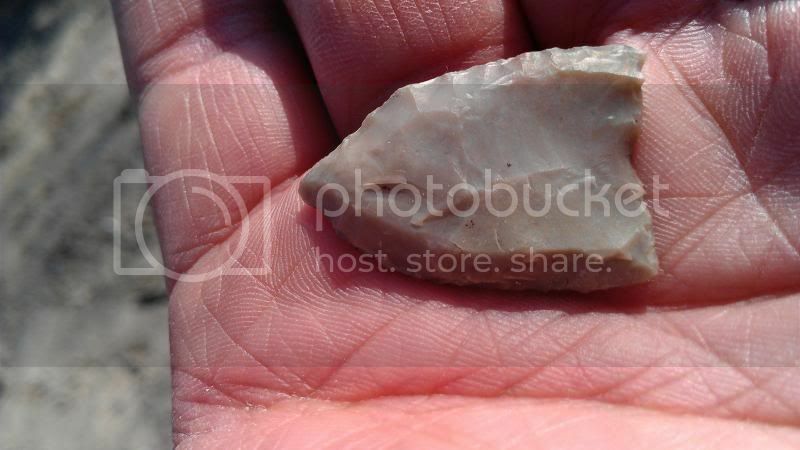 The biface to the left of the folsom is very thin and knapped all the way around. Kind of like a round nosed tortugas. Everybody likes "insitu" pics..good job on the extra effort..
Just a friendly Q. . . .are you Sure that one point is really petrified wood ? in the picture, hard to see any slight "grain" trends. 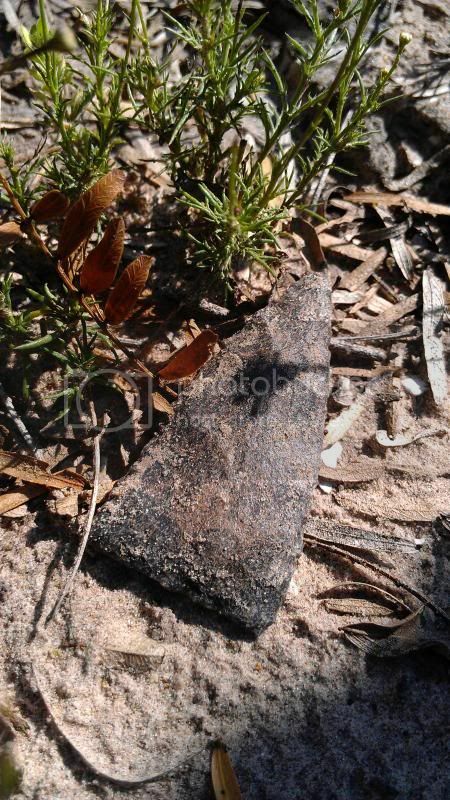 It looks like petrified wood with the grains running down the length of the artifact, but I could be wrong. 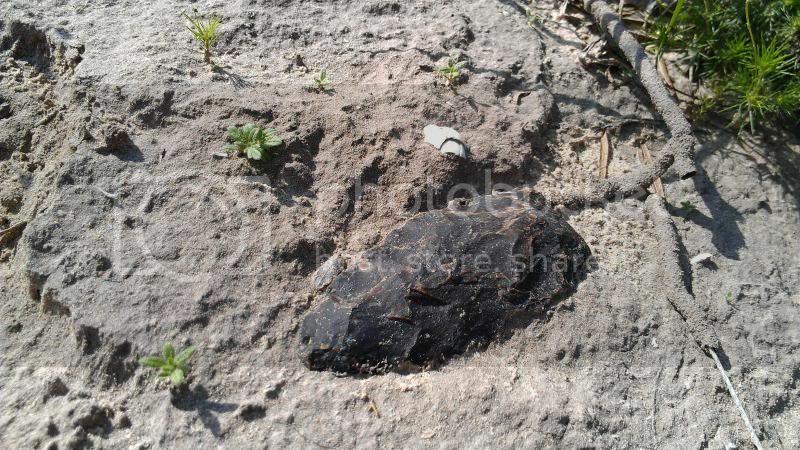 It's also pretty big and most of the material for flint knapping down here are small fist-sized rocks. 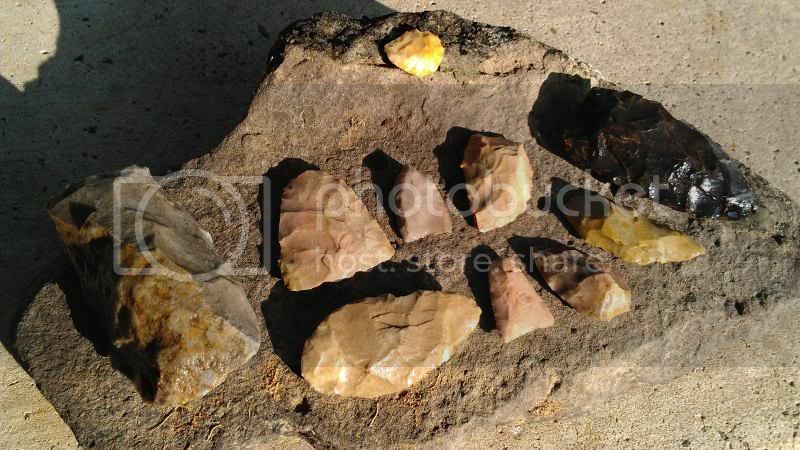 A lot of the larger tools I find are made out of petrified wood. There's some decent petrified wood in that area. 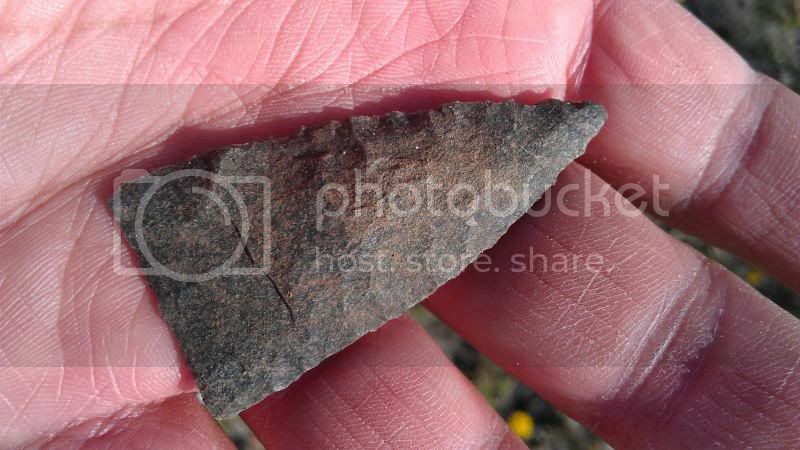 Found several agatized pieces and one of the best pieces I found had the bark still on. You could see the tree rings in that one. If anyone can help me ID this one, I'd appreciate it. My guess it's a Rio Grande. 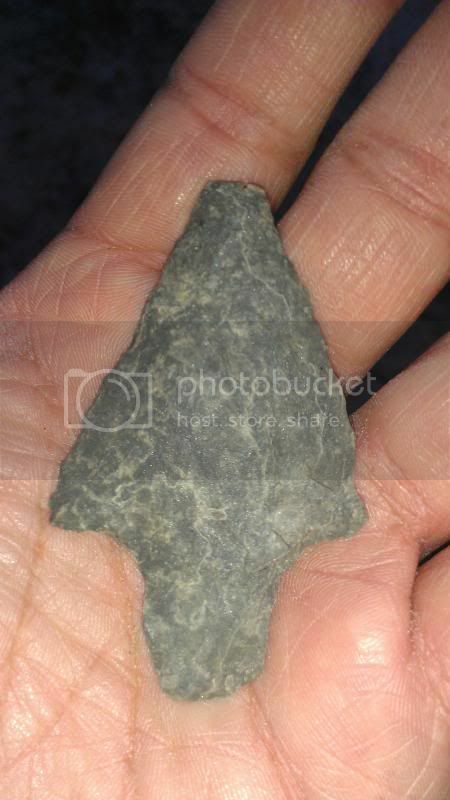 Re the Rio Grand point, One was found on the upper Sabinal river recently with a very similar overall design, TJ said it was an early stemmed. The subject of Starr and Zapata counties got me to thinking about some material I used to find there that looked like alibates or tecoves. Has anyone found or have a comment about this stuff? "Stuff" is a highly technical term that I use. 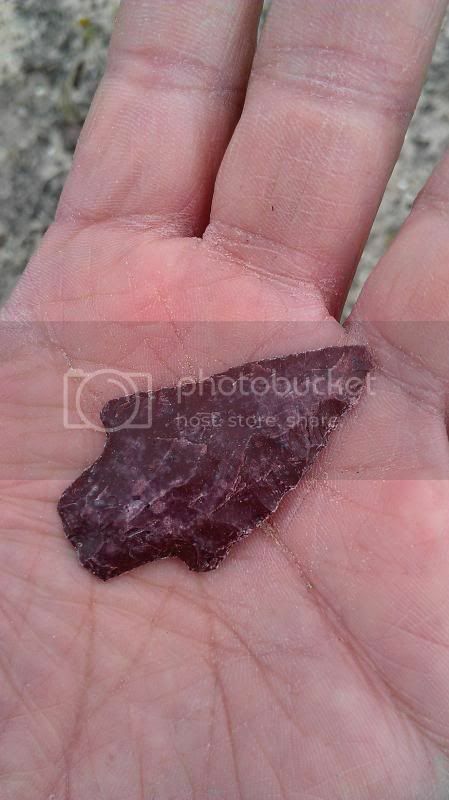 Never found anything like alibates when hunting there, did find a lot of agate and some agatized wood. 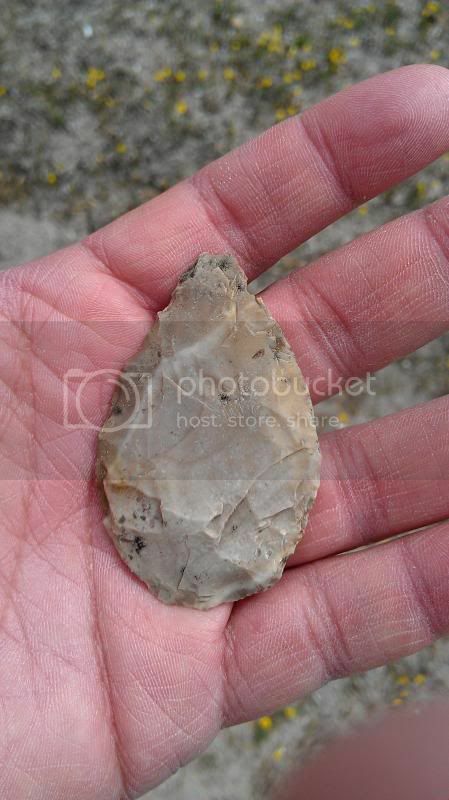 Also, some of the points that I found there were of the same flint that is common in points found in Mexico. A lot of carryover of material. 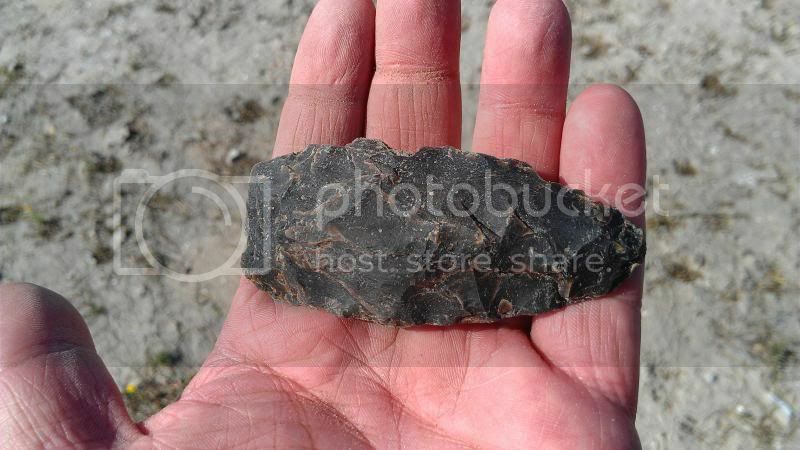 The Mexico flint is of a drab black or black and white type. 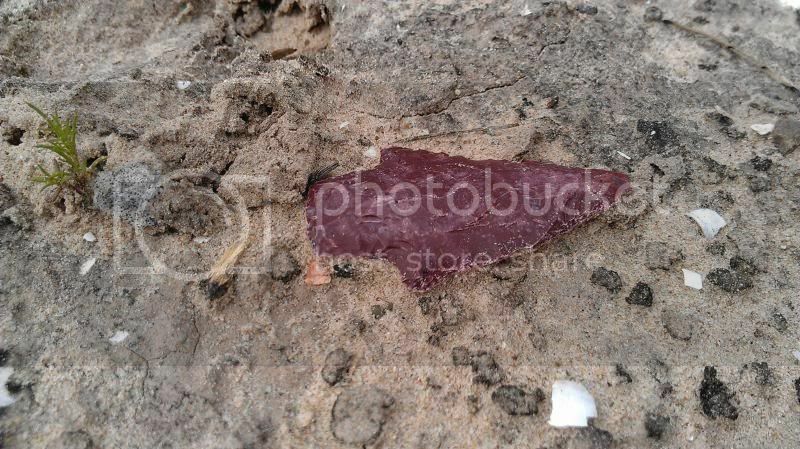 Tehuacana: that alibates material I was talking about is probably agate. It had that red and cream [beafsteak] look about. I bow to the master. 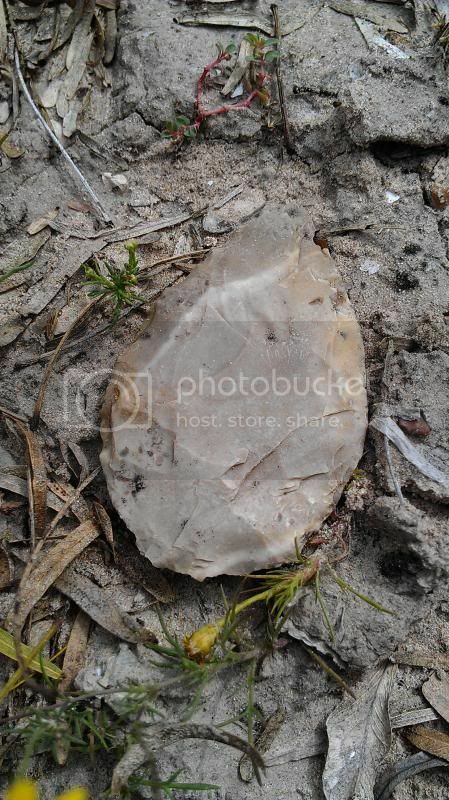 I've found some real find agates hunting around that area. Used to do lapidary work and found green banded agates up on the Christ hill near Rio Grande City. Right on past the town of Falcon there used to be a place rock clubs had permission to hunt. 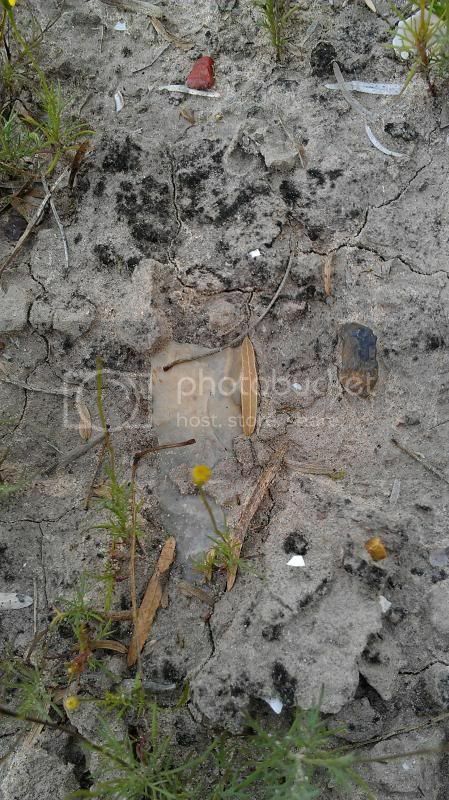 Found a lot of agatized snails and coquina's. I still have some of the snails but the coquina's, as small as they are, have long since disappeared.